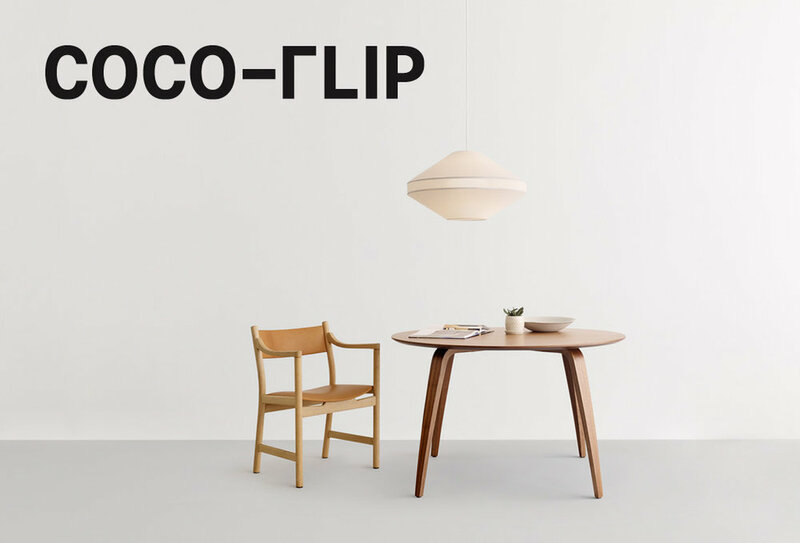 Danish company Vipp have been manufacturing beautifully made metal products for the home for over 70 years. Their waste bin designed in 1939 by Holger Nielsen is possibly the most well known domestic trash can in the world and the brand has become synonymous with excellence and longevity in small metal products like waste bins, toilet brushes and laundry baskets. It comes then as some surprise that in one fell swoop they have entered both the kitchen and bathroom markets and opened a small group of exceptional and extremely personal hotels. Who could resist such a destination? 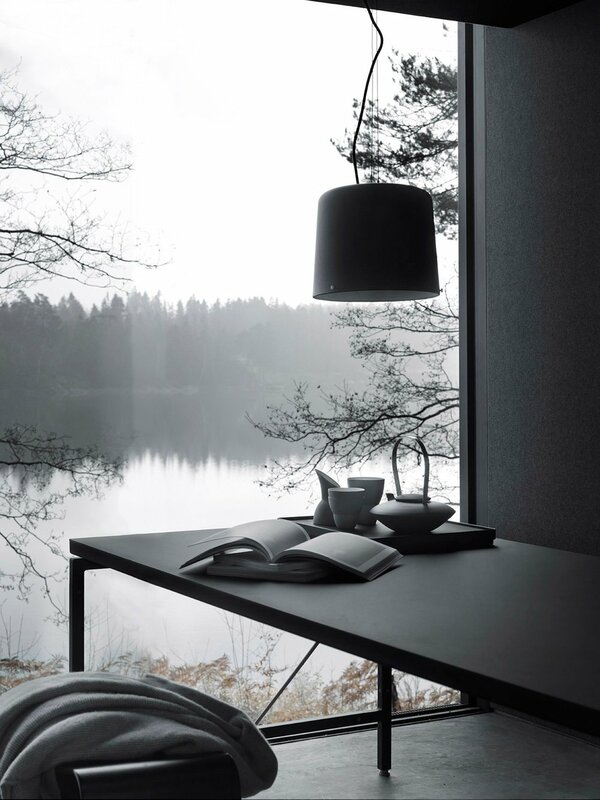 A meticulously designed haven beside a lake in a Swedish forest in Autumn...... equipped with the new Vipp kitchen and all the brand's residential products - lights, a daybed, table and heaps more. Photograph by Anders Hviid. Vipp's 'Shelter' has been doing the rounds of design blogs and social media since it was first revealed to the public in October 2017. Its splendid isolation has sparked everyone's imagination around what constitutes a remarkable and memorable place to stay while on holiday. While it has to be said that the connection between a manufacturer of metal products and bespoke accomodation is a tenuous one, the resulting publicity has been worth the cost and years of research and development. The dining area of the Vipp 'Shelter' with examples of the brand's new foray into lighting and furniture. Situated on the southern tip of Immeln lake 23 km north of the city of Kristianstad and 127 km from Malmö airport (Copenhagen airport is just 150km away should you prefer to drive from Denmark). The sleek cabin is small but perfectly designed for an intimate getaway for two people. 'Shelter' has its own private wooden pier with canoe hire 100 metres away and hiking trails nearby. Pleasantly isolated but within a short drive to restaurants in Kristianstad, 'Shelter' offers an experience that is becoming increasing rare. Designed to allow the visitor to observe nature and the seasons from every angle, the building offers protection from the elements in winter and opens up to connect with nature in the summer months. Lake Immeln has over 200 islands to explore by canoe and is a population fishing destination. The new Vipp kitchen is at the heart of the Vipp 'Shelter'. The same level of detail has gone into the 55 m2 metal and glass building as with the smaller Vipp products that furnish the space - lights, furniture and accessories. The 55 m2 building is made entirely off-site in the Vipp factory and craned into position as a finished product. It features large expanses of glass both in the form of floor to ceiling sliding doors and oversized skylights. Using the expertise and technology developed by the company over 70 years the building is fabricated in steel with internal linings of felt, The interior is decked out with the entire catalogue of Vipp objects and furniture - pendant lights, daybeds, tables and benches along with the brands new towels, tapware and mirrors. Shelter is not the only Vipp Hotel on offer.......From November 1 Vipp Hotels has been taking bookings on their boutique offerings - apart from Shelter situated on Immeln lake in Sweden, there is a spacious converted warehouse in the dock area of Copenhagen, and a third hotel under construction in a famous old factory building on the north harbour of Copenhagen. The term hotel is used advisedly as unlike conventional hotels with their minibars and long anonymous hallways, those in the Vipp group are more akin to an exceptional house sitting experience. The Vipp 'Loft' is situated above the brand's headquarters in an old warehouse space in the dock area of Copenhagen. Recently revamped by Studio David Thulstrop the loft is a much bigger affair than 'Shelter' suitable for up to four visitors with an extremely generous 400m2 floor area split over two levels. The interior includes the full range of Vipp products including the kitchen and bathrooms items but also a collection of important Danish furniture pieces such as the 'Tired Man' arm chair by Flemming Lassen from By Lassen, Fritz Hansen 'PK 22' lounge chairs by Pierre Kjaerholm and Hans Wegner's remarkable 'Swivel Office Chair'. The odd German designer gets a look in too with Konstantin Grcic's 'Clerici' chair for Mattiazzi taking pride of place near the Vipp kitchen. The light-filled lounge area of the Vipp 'Loft' with its metal spiral staircase and restored timber beams. The Vipp 'Loft' features characterful exposed timber beams and views across the docks. The city of Copenhagen is less than 10 mins by car away but the experience is very different from an inner-city hotel. Personal touches include a vintage coffee table once owned by the founder of Vipp along with sculpture and ceramics carefully chosen to reflect Denmark's interest in craft and the arts. The entire space is a happy meeting point of Danish design and craft - past and present. The latest offering in the Vipp Hotel group is still under construction but is due for completion in early 2018. Situated in Østerbro near the harbour to the north of Copenhagen, the Chimney House is a landmark former pump house building designed in 1908 by architect Hans Wright. Complete with its own massive ventilation tower or chimney, the patterned brick structure has been restored into a 150 m2 dwelling by Studio David Thulstrop and Aarstiderne Arkitekter and promises to be a wonderfully unique experience. The Chimney House - Vipp's latest Hotel site in Østerbro, Copenhagen will be complete in early 2018. The simple industrial building previously known as the Kloakpumpestation will be transformed into a 150 m2 domestic space by Studio David Thulstrop and Aarstiderne Arkitekter. The price for a stay at 'Shelter' is currently set at 1000 euro per night (maximum 2 people) while 'Loft' is 1500 euros per night and sleeps 4. For more information on Vipp Hotels visit the brand's website here. All the Vipp products including the new kitchen and bathroom cabinets and lighting and accessories are now available in Australia through Cult.